I am a total coffee addict. The first thing I do when I wake up is make a giant foamy soy milk latte. I go to bed excited about the awesome coffee I’m going to have in the morning. Often, I am running out the door with a banana or a granola bar, but really my favourite treat with coffee is a sweet pastry or dessert. It’s nearing the end of strawberry season, and honestly, some of the strawberries I had were just not that yummy raw. 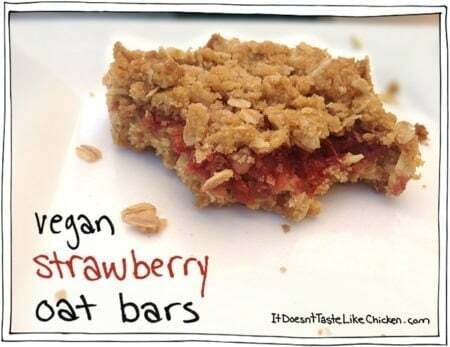 So I was inspired to create these vegan strawberry oat bars. Killing two birds with one stone….er….getting two great results out of one recipe. A delicious treat to pair with coffee, and using up the otherwise not so exciting strawberries. To make Vegan Strawberry Oat Bars: add the strawberries to a small saucepan over medium heat. Add the maple syrup and lemon juice, the strawberries will begin releasing water. Bring to a boil and sprinkle in the cornstarch while stirring. Let the strawberry sauce simmer until it starts to thicken. It should be a thin jam consistency. Remove from heat and stir in the vanilla extract. 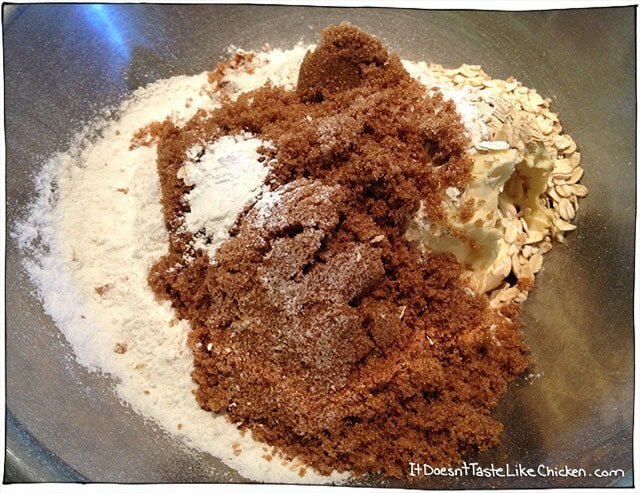 Add all of the oat layer ingredients into a large bowl. Use a fork or pastry cutter to mix it until it reaches a crumbly texture. 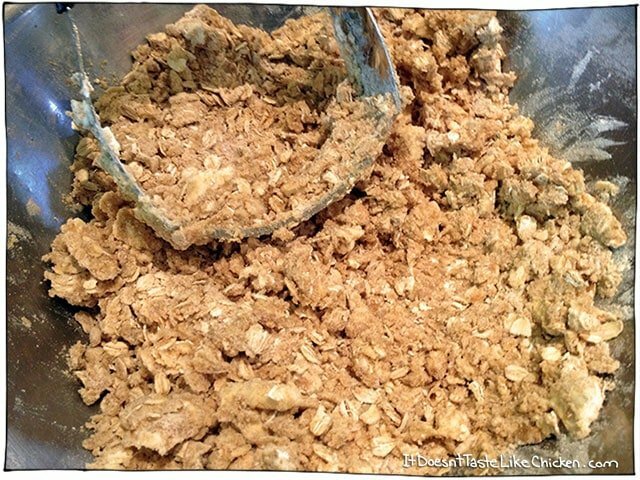 Pour about half of the oat mixture into the prepared baking pan and pat down. Pour all of your strawberry sauce on top and spread around to evenly distribute. 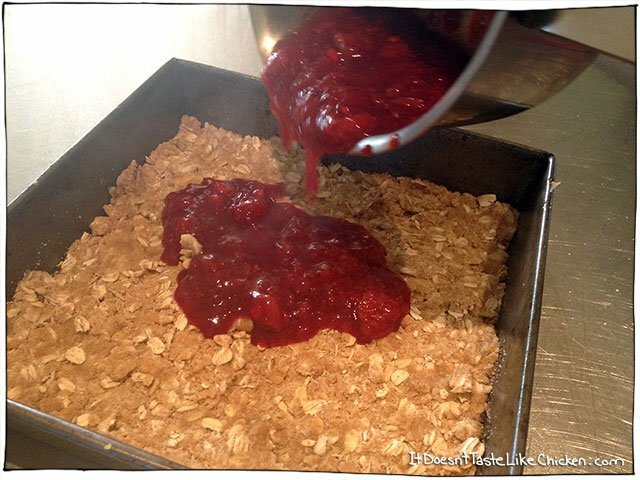 Sprinkle the remaining oat mixture on top of the strawberry sauce, and lightly pat down. Bake for 30 to 40 minutes, until lightly browned on top. Let cool before serving. Perfect paired with coffee or tea for breakfast or dessert. Preheat your oven to 350F (180C). Lightly grease an 8" x 8" pan. 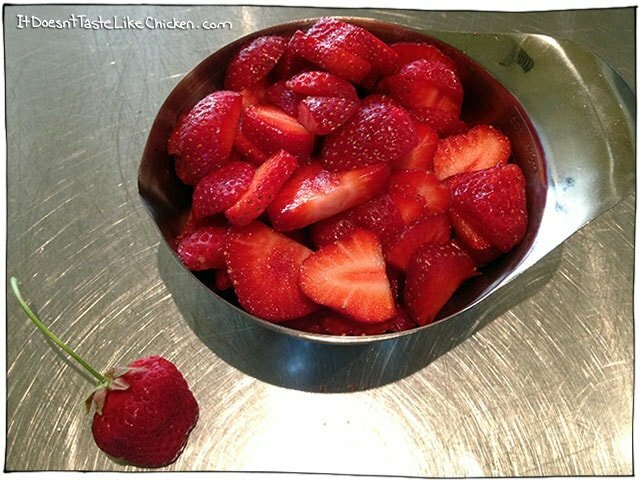 Add the strawberries to a small saucepan over medium heat. Add the maple syrup and lemon juice, the strawberries will begin releasing water. Bring to a boil and sprinkle in the cornstarch while stirring. 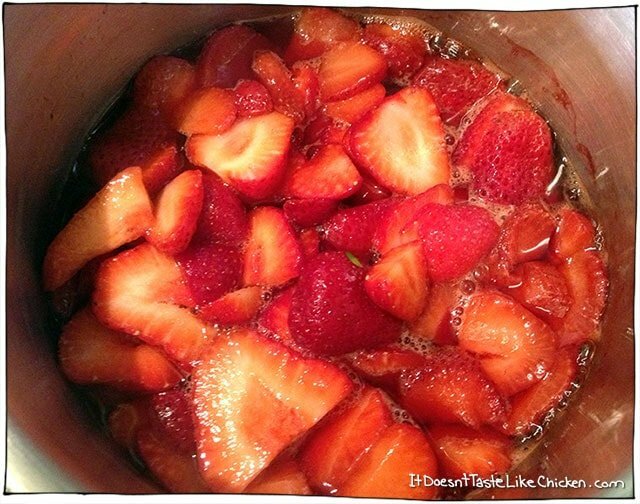 Let the strawberry sauce simmer until it starts to thicken. It should be a thin jam consistency. Remove from heat and stir in the vanilla extract. A-mazing! I made these today to bring to a friends tomorrow. (Un)fortunately their daughter has a nut allergy and the flour I used was manufactured in a facility that also proceeses nuts. I just got back from buying new, nut allergy safe flour. Looks like this was a fortunate mistake because this batch is staying with is! They are soooooo good! Delicious! i made them with strawberries first. Then the second time I craved peaches so I made them with peaches. Just delicious! Thank you for the recipe! Y’all. 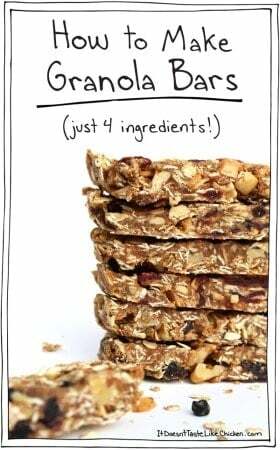 Drop all of the other GF oat bars on Pinterest because this is IT. I made half of the recipe because I only had like a cup of raspberries so I just cut all ingredients in half. Also, rather than oat flour I used half cassava flour half oat flour and then of course half a cup of oats for that “crumble. How have these eluded me for so long? These are soooo tasty and super simple. Sam, it’s so neat to go into your “archives”. Your photography skills have improved immensely. These are delicious! I will be making them again and again. I would like to try this with other fruit. Do you think apples would work? Yes, peeled and chopped apples should work ok. You may need to add a splash more water when cooking them down. Enjoy! I have to say I had a hard time with such a large amount of strawberry ‘jam’ and “spreading” the oat mixture on top of it was nearly impossible. hope all this work pays off! I hope you love them! 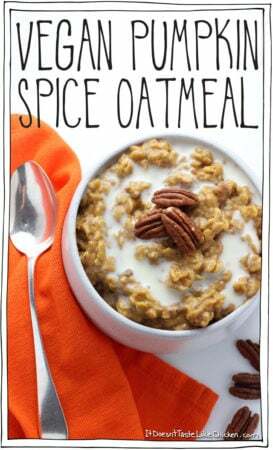 Next time, try sprinkling the oat mixture on top, instead of spreading. It will make it much easier! How many people does this serve? Do you have the calories and macros for this? These look delicious. 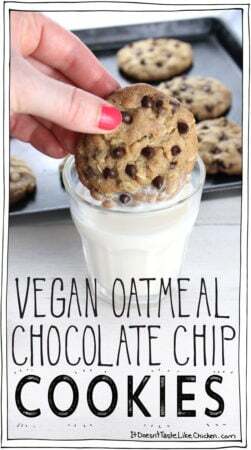 Unfortunately these are not vegan due to the fact that this recipe requires brown sugar. Bone char from cows is used in many processed white sugar and brown sugar is just white sugar with molasses. Very good to be aware of what sugar you are purchasing! I think blueberries would work just fine. Enjoy! How do you think frozen fruit would work in this? Absolutely! It might take a bit longer for the fruit to cook as it will have to thaw as well, but you should have no problems. I just HAD to make these and I’m so glad I did! I used frozen strawberries (slowly defrosted in the microwave in 30-second intervals–30 seconds, shake and flip bag…another 30 seconds, etc.) It worked PERFECTLY! The only thing I did that I wish I hadn’t was to freeze the completed bars. When I first baked them and they cooled the texture was AMAZING! The strawberry filling had this incredible chew–sheer perfection! Unfortunately, when I froze the bars, that chew disappeared. The flavor is still absolutely wonderful, but I am missing that special chewiness of the filling. Next time I’ll know better! 🙂 Thanks SO much for such a delicious recipe!!! Have you ever made these and froze them for later use? What are your recommendations for storing? I just made them, they are delicious…but I was wondering how to enjoy them without eating the entire pan in one day ;)?!? 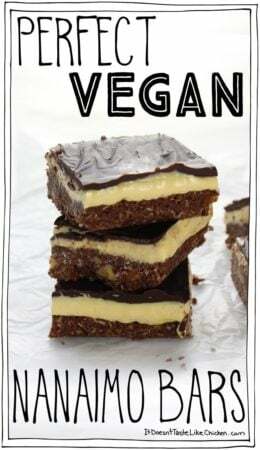 These bars look so yummy! 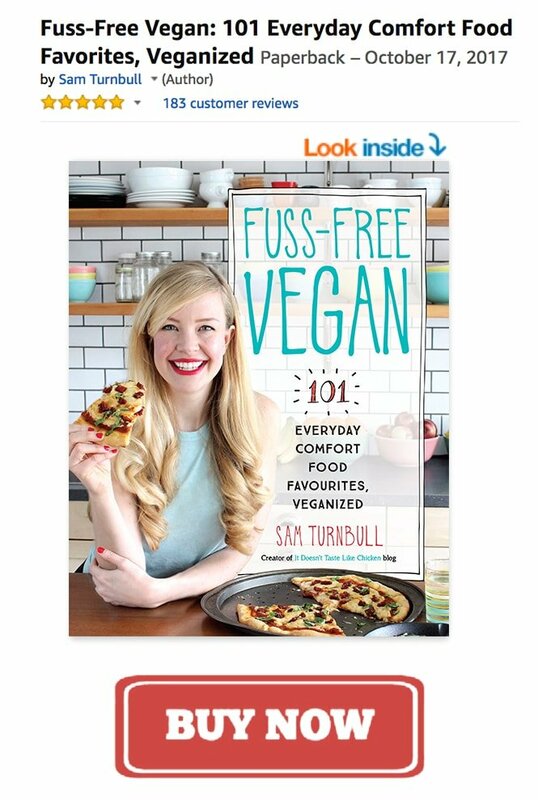 My daughter suffers from egg, dairy,peanut, tree nut allergies so often time we eat vegan. I am so thankful to have found this site because at 26 years old I still can’t cook a darned thing without following recipes EXACTLY. Your healthy choices are having a positive impact on soooo many people with allergies so THANK YOU! Hahaha! 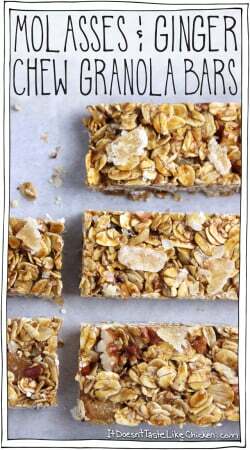 I had you at oat bars? I made this today using coconut oil and it came out amazing. My husband who is not a fan of strawberries loved them. Ty for the recipe. 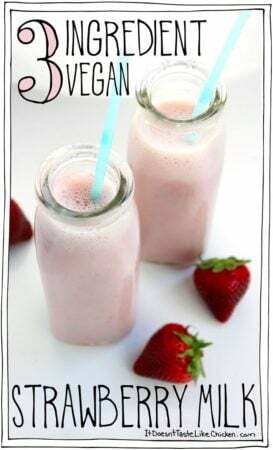 I make mine with coconut oil as well so it basically tastes like coconut strawberry oat heaven! We picked some strawberries at a local farm yesterday and now I am making another batch of these delicious treats! We freeze them and they taste even better as a cold treat! Thanks again itdoesnttastelikechicken! 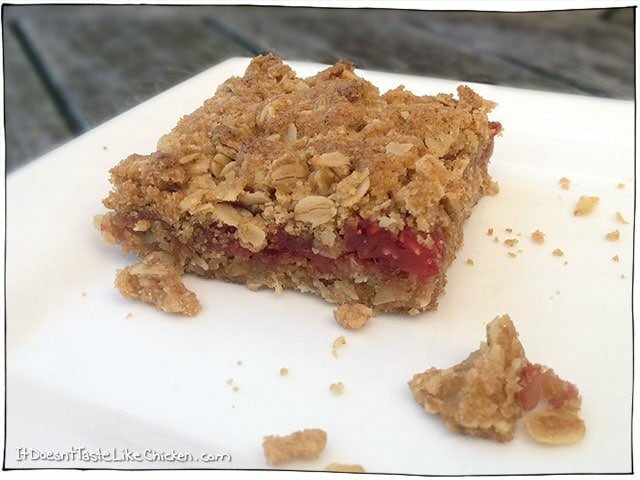 Coconut strawberry bars!! Yes please!! I love that they are even better frozen, I had no idea as mine are always gone too quickly! It looks good and it was good. Glad to share! Thanks! I made adding more sugar an option so it could be a bit sweeter like you would have preferred!